Bridal Party Tees has two questions for you. Are you getting married this year and do you love German beer? 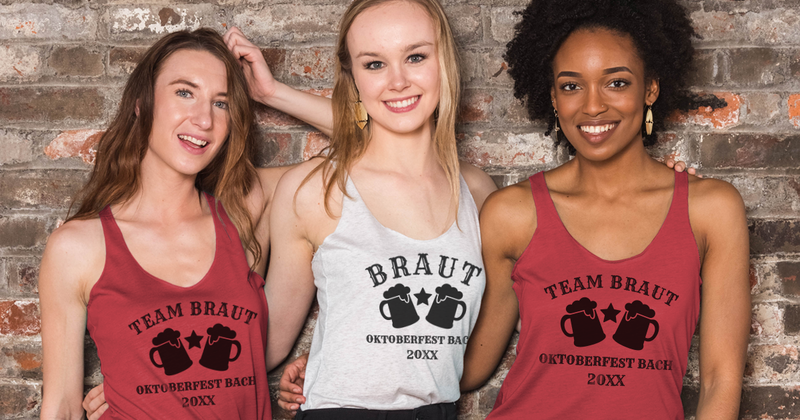 If you said “yes” to both then celebrate your upcoming nuptials and all things German with bachelorette party shirts for Oktoberfest! Oktoberfest is the largest beer festival that is held every fall in Germany. For many enthusiasts, making the long journey to Europe isn’t always an option. Cities all over the country do their best to replicate the authentic German festival so everyone has a chance to enjoy the festivities. Brats, beer, or the vibrant culture – whatever you love most about Oktoberfest can be translated over to your designs. Oktoberfest is a great time to throw your bachelorette party. It’s one big party and everyone is happy to celebrate with you and your maids. 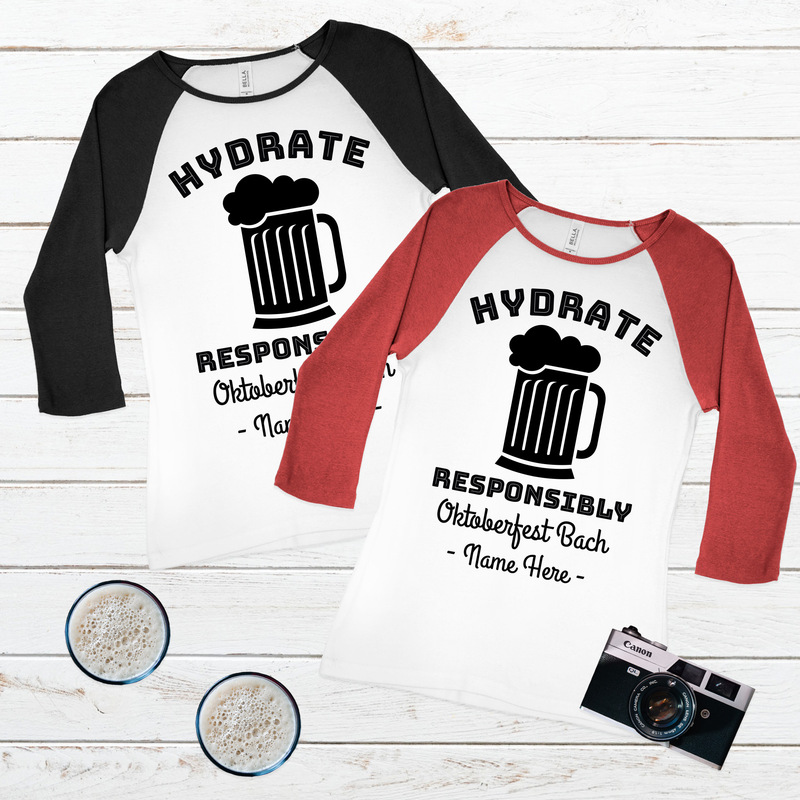 Creating custom bachelorette party shirts for Oktoberfest makes this moment in time even more memorable. Let’s be real here, it’s going to be one hard night to remember. Our gallery is full of the most designs to express your love for all things Oktoberfest but with the ability to customize, you can achieve the ultimate design that will surely make you stand out in the crowd. All you have to do is choose one your favorite design or style of shirt and then click the “start customizing this design” button. In the Design Center, click on the Add Art tab. See the category drop down menu there? Choose the Holiday & Seasonal category and then the Oktoberfest subcategory. In there you will find one of a kind Oktoberfest art that includes beer, brats, and even lederhosen. Now you can create any Oktoberfest design and be as creative or simplistic as you want! Mirror, mirror, on the wall, who’s the fairest bride of them all? Look no further because Bridal Party Tees has the most enchanting bachelorette party shirts around and we’ve got the pictures to prove it. It’s time to party like a princess with these Bibbidi Bobbidi Crew Shirts! These ladies created their designs completely from scratch with the art and text provided within our design center. This is exactly what we want for our customers and we are so inspired by their creativity that our in-house design team has created one-of-a-kind Bibbidi Bobbidi text art that will make all your dreams come true. Choose an existing design from our gallery and add names, dates, locations and swap out products to fit everyone’s style. Really stand out by adding metallic foil just like these ladies did. Be the happiest bride in the happiest place on earth with custom Bibbidi Bobbidi Crew Shirts! Which saying if your favorite? Share your thoughts and pictures with us via Facebook, Twitter, or Instagram @bridalpartytees! The date has been set and the bridal party has been chosen. The bride and her bridesmaids are consumed with every single detail from their hair to their shoes but what about the guys? That’s right – the groom and his groomsmen. It’s just big as deal for the groom to say those vows and he’ll want to remember every minute too. Bridal Party Tees doesn’t want the fellas left out. We’ve put together some of the best bridal party shirts for men so they can party just as hard as the ladies. Bridal Party Tees offers not only a huge selection of custom apparel for women but also a great variety for men. We’ve got apparel and designs for every theme you can image – jerseys for your sporting event or tailgate hoodies with pockets for your beer. 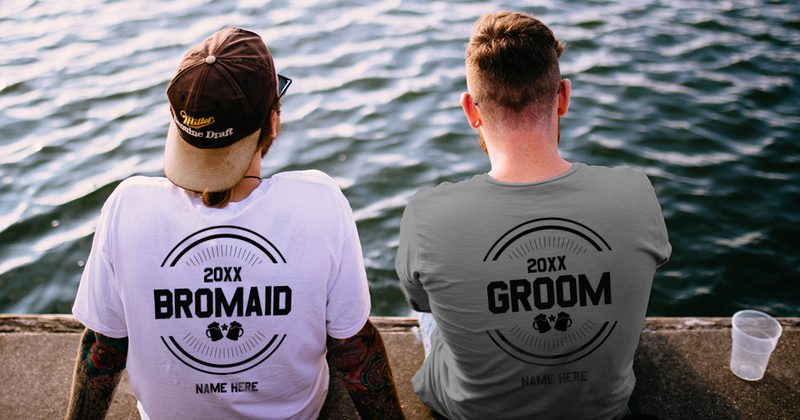 We’ve provided bridal party shirts for men that are ideal for any groomsmen style or bachelor party theme. Sporty, nerdy, or destination – we’ve got them all. Every design in our gallery can be customized in our one-of-a-kind design center. Easily change text, images, product styles, or even upload your own image. Picking the best design for all your men can be tricky but not when you design with Bridal Party Tees. Don’t stop with shirts! Step up your game and customize matching accessories as gifts for all of the groomsmen. Bridal Party Tee’s offers custom shot glasses and custom flasks that would make memorabilia for this monumental time in your life! We completely understand that creating a great design can be overwhelming. If you need any assistance please do not hesitate to contact our amazing customer service team. They would be more than happy to help you with your design from beginning to end!